Pauline Maier, William R. Kenan, Jr. Professor of American History in MIT's School of Humanities, Arts, and Social Sciences, has won the 2011 George Washington Book Prize for her book Ratification: The People Debate the Constitution, 1787-1788. "The George Washington Book Prize is co-sponsored by Washington College, the Gilder Lehrman Institute of American History and George Washington's Mt. Vernon. Its $50,000 award is the largest prize nationwide for a book on early American history, and one of the largest literary prizes of any kind. It recognizes the year's best books on the nation's founding era, especially those that have the potential to advance broad public understanding of American history. The jury that chose Ratification as a finalist from among 59 entries call it "a tour de force of extraordinary research and scholarship." In many thoughtful commentaries, reviewers have agreed, hailing Maier's book as "masterful" and "definitive." Maier, author of five previous books on the history of revolutionary America, received the prize Wednesday, May 25, 2011, at Mount Vernon, the home of George Washington, located near Washington, D.C. The award was presented by U.S. Supreme Court Justice Samuel Alito. The debates over drafting the Constitution that took place in Philadelphia in the summer of 1787 have long been enshrined in American history. 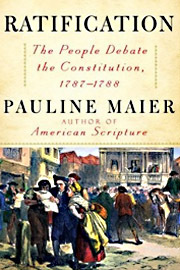 But Maier's book reveals an equally dramatic and essential—though almost forgotten—series of debates that played out during the year that followed, as citizens, journalists and politicians argued, state-by-state, over whether to ratify the nation's founding document. "This book will prove to be an eye-opener to many people who think that drafting the Constitution was the end of a long road to creating a strong and effective government," said Mount Vernon's president, James C. Rees. "Getting the document ratified was an uphill struggle most historians ignore, and on more than one occasion, the entire unification process was almost doomed to failure." The George Washington Book Prize, created in 2005 and co-sponsored by Washington College, the Gilder Lehrman Institute of American History and George Washington's Mount Vernon Estate, honors the year's best book about America's founding era. Maier has been a member of the MIT faculty since 1978, teaching courses such as 21H.112 (The American Revolution) and 24H.104 (Riots, Strikes and Conspiracies in American History). Ratification was published by Simon & Schuster in 2010. The book also won the 2011 Fraunces Tavern Museum Book Award earlier this year. ..Ratification is an ur-text of the Almanac of American Politics. It has process, issues, arguments, local context, major players, minor players — and hoopla. 'The popular excitement' that attended the struggle, Maier writes, 'reminded me at times of Americans’ obsession with the final games of the World Series, but with greater intensity because everyone understood that the results would last far longer than a season. . . . Politics was in a real sense the first national game.'"